Your patient just got cannulated and started on ECMO. Congratulations! Now what? The initial steps of starting a patient on ECMO get all the glory, but what about the following minutes, hours and days? At a minimum, you will be responsible for managing the patient until they are transported from the ED to the ICU. ED residents rotating in the ICU may be rounding on these patients on a daily basis. Let’s review the basics information that you will need to gather. Why were they started on ECMO? This will be fairly obvious because you were there when they got cannulated. Coming from the ED, this is most likely due to refractory cardiac arrest, although other indications exist. Most common sites are femoral artery and vein. Right internal jugular is another common site. Depending on your institution, equipment, patient factors, and provider preference, the patient may be cannulated at other sites as well. This will be readily apparent based on their cannulation sites. Generally speaking, VA ECMO can assume circulatory and ventilator function, while VV ECMO is unable to provide circulatory function. Now we are ready to collect some information from the ECMO machinery itself. At our institution we often use the CARDIOHELP System, pictured above. The appearance of the machinery and where to locate the numbers varies by device. This is the pump speed of the ECMO circuit. Changing the RPM has an impact on flow. These values represent the pressures of the inflow and outflow cannulas. Knowing the difference between these may be helpful. High inflow pressures can cause “suction events”, when the cannula suctions against the inside of the vessel, causing drastic drop in flow. Sweep is the setting that controls how much CO2 the ECMO machine removes from the blood. Our system has 2 dials that control sweep; one for larger adjustments and one for fine-tuning. Right next to the sweep control is the oxygen mixer, which controls the FiO2. 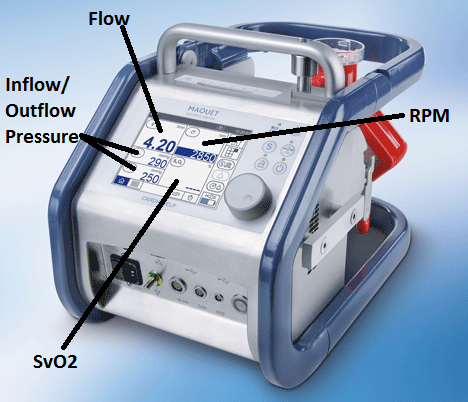 Obtaining optimal oxygen saturations, PaO2 and pCO2 levels is a balance between the ventilator and the ECMO machinery. Running high volumes of blood through artificial circuitry increases the probability of thromboembolism. Patients must be anticoagulated. This is often done with a heparin or bivalirudin drip, with concomitant monitoring per institutional protocol. Foreign bodies can be a nidus for infection. Patients may stay on ECMO for weeks or months, and infection is always a concern. Consider starting your patient on empiric antibiotics to help prevent this. Cefazolin and vancomycin are a common combination. 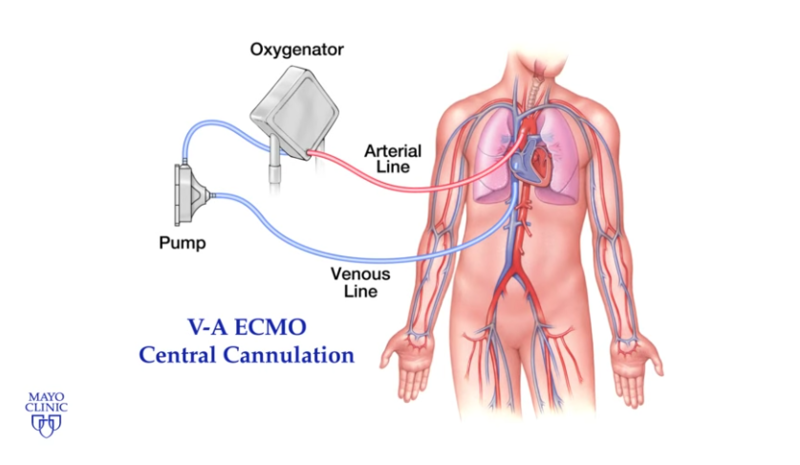 Ventilator: Not all ECMO patients are on a ventilator, but those who are require balancing ventilator settings with ECMO settings to provide appropriate oxygenation and ventilation. PA catheter: Select patients may have Swan-Ganz catheters in place, allowing for continuous monitoring of hemodynamic parameters including cardiac index, wedge pressure, pulmonary artery pressures and CVP. SVO2 and ABGs can be drawn from both the patient and from the ECMO circuit and compared. This is usually scheduled multiple times per day, with more frequent checks as needed with any change in clinical status. Pay close attention to where the blood gas was drawn as there can be big difference between right and left arms depending on the location of the mixing cloud.